The Legend of Zelda A Link To The Past 2 was barely announced by Nintendo and it seems that some lucky beggar has had the chance to sit down and play a chunk of the early game code. In this ten minute video of direct game play footage we see Zelda going about his usual dungeon exploration but with a few new twists – like the ability to go paper-thin and navigate around walls to new areas. Sit back and watch the colourful old-skool goodness unfold as we get a glimpse in to the game that might finally push the 3DS in to more core-gamer’s hands. 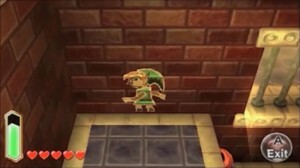 The Legend of Zelda A Link To The Past 2 is scheduled for a release date of Holiday Season 2013 on the 3DS. I am surprised you guys never finished it. I remember when it came out for super nintendo i couldn’t bring myself to put it down. I still play it AT LEAST once a year. Its my favorite Zelda game. I just hope its the same in terms of boss battles. First the three pendants and then the 7 elders in the other world.